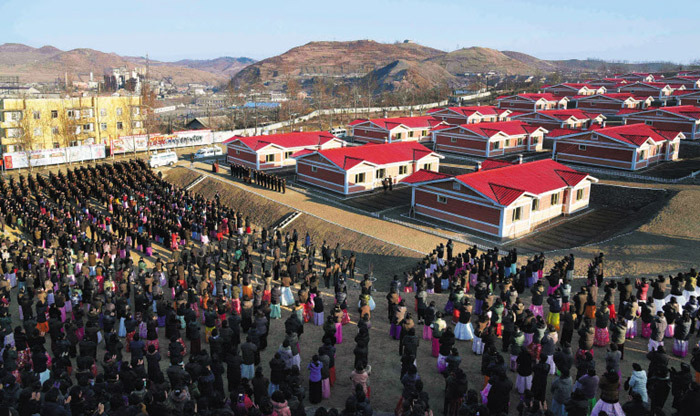 Some 12,000 North Korean families have moved into newly built homes in flood-ravaged North Hamgyong Province, the North's official Korean Central News Agency said Monday. The Unification Ministry here estimates that around 15,000 homes were destroyed in the recent floods in the North and some 37,700 households were affected by the disaster. But the regime also found the money and manpower to make life more agreeable for leader Kim Jong-un. A private road is being built in the province so Kim can get to his summer homes there, according to a source. The homes are in Kyongsong, which is famous for its hot springs.